A 57 year young woman presented to the clinic 4 months after a breast cancer diagnosis of the left breast after a routine mammogram. After this diagnosis, a lumpectomy was performed to remove the tumor as well as remove her lymph nodes to test for spread of the cancer. The tumor was 3.8 centimeters when removed and 8 of the 12 nodes were positive for cancer. The first surgery did not have clear margins so a second surgery was performed to assure complete removal of the primary tumor. The tumor was found to be estrogen and progesterone receptor positive (ER+ and PR+) and HER2 negative. Both her mother and grandmother had ovarian cancer and her father had a history of bladder cancer. She was advised by her oncologist to pursue radiation and chemotherapy treatment and had a port inserted into her chest for that purpose. After reflection she declined those options and came to our clinic for evaluation and treatment. When the patient came in she was feeling well, sleeping well, and had good energy throughout the day. She had healed well from the surgeries, but was experiencing hot flashes about 10 times through the day and also was having night sweats. She had watched her mother and two friends undergo conventional cancer care, which had been unsuccessful in resolving the cancer as well as a trying experience to forgo. She was strongly interested in finding other options. In our workup we saw that she was deficient in potassium, zinc, calcium, and essential fatty acids. Her chapman organ reflexes indicated increased stress on the stomach, thyroid and liver. Her tongue was scalloped with a pattern of cracks – both of which indicated that she was not regulating blood sugars well. This is an important factor given cancer cells have a preference for sugar as an energy source. On her skin were numerous cherry moles or cherry hemangioma’s. This is a physical examination sign that indicates a person with increased levels of an enzyme called Aromatase. Aromatase is an enzyme that converts hormones, and this extreme stimulation of estrogen, will also stimulate cancer growth. Conventional medicine will use drugs such as Tamoxifen or Anastrozole to block the aromatase enzyme activity, but unfortunately it is often poorly tolerated due to frequent uncomfortable side effects. At her report of findings visit we reviewed her cancer type, as well as outcome data likelihood with chemotherapy and radiation, all based on her diagnosis. She very strongly did not wish to do either chemotherapy or radiation. The doctor advised her that while the chemotherapy benefit was relatively slight based on the data, the benefit of radiation therapy locally was more significant. When in combination with our clinic patients generally tolerate conventional care very well and with less side effects because the care is additive and synergistic, not antagonistic. She had strong family support for her decisions and we supported her in her health care choice and philosophy. She would be open to and consider other options in the future but for now she wanted to only pursue our care. We advised her on our Anti-Cancer Diet, uniquely modified to her diet needs and cancer type. She was tested for food intolerances and found to be individually intolerant to potatoes, meaning she would cut those from her diet completely. She also had a combination intolerance for fruit when combined with cane sugars. This meant that is she was going to have an apple for breakfast, she would need to wait about 10 hours before she had say a baked good containing cane sugar. Lowering the frequency of these intolerances allowed her body to put energy towards fighting her cancer, instead of energy towards calming down her bodies inflammation. We prescribed whole food concentrates to restore her nutrient deficiencies as well as provide the building blocks for the growth of healthy breast tissue. In addition we prescribed both a special form of essential fatty acid, and Iodine, that helped with fighting the cancer cells. We used a comprehensive anti-cancer herbal protocol specific for her case. This combination of clinically and laboratory tested natural medicines worked to improve immune attack against cancer cells, as well as disrupt various phases of cancer cell growth, replication, and metastasis. This combination of medications also included herbal extracts that aimed to reduce the expression and activity of the aromatase enzyme. Click here for a research review on just one of the extracts prescribed for this case. We began comprehensive therapeutic clinical interventions in the form of 3 weekly Bio-Thermal Therapy® treatments. These were designed to assist digestion, improve immune function, liver and kidney function, and improve the body’s fight against the tumor. She was prescribed 24 treatments to be completed before re-evaluation. We initiated high dose intravenous vitamin C therapy. These dosages are well above what can be taken orally. There is extensive laboratory and clinical research showing the benefit of High Dose IV Vitamin C (HDIVC) in cancer. We use the University of Kansas protocol designed to be used in conjunction or independently of conventional oncological care. We did these on the same days as the Bio-Thermal Therapy ® treatments. The patient started her therapies and treatments at our clinic. She completed her course of IVs for a loading dose and the full course of advised weekly HDIVC after being in remission for one year. During her treatment here, about 2 months into care, she was contacted by her oncologist and encouraged to pursue radiation therapy. She brought that to our attention and we agreed with the oncologist that the local radiation would have benefit. Again we advised the synergistic additive benefit with our care and the likely reduction of side effects that our care would afford. She decided to think and reconsider her options. About this time, around 6 months after her initial diagnosis and two months into our care we ran an AMAS (Anti-Malignin Antibody in Serum) blood test. AMAS is a blood test that identifies antibodies produced by our bodies to fight malignant cancer tissue. It is a sign of immune activity against cancer. Some AMAS is detectable for all of us. Elevated levels indicate significant immune activity against a malignant cancerous process. One of the advantages of the AMAS is that it can be detectable at levels that are below our current abilities to image tissue. Her levels at her first test were mildly elevated and this can be associated with a better prognosis as it indicates immune activity. However, we will want later tests to show a decline to normal and stable. This occurred in her case at her annual test and stayed in the normal level for the several years after that. Eventually she opted to pursue the radiation alongside our care as well, about 9 months after diagnosis and six months after starting our care. She tolerated it very well though several months after completing her radiation course there was some temporary restriction in shoulder movement that felt like a tightness. Her oncologist thought it to be adhesions and scarring in the shoulder from the radiation. We applied frozen shoulder variations of our Bio-Thermal Therapy ® physiotherapy treatments that she was already taking as a part of her care and restored her shoulder function. Genetic testing by her oncologist at one year showed a mutation associated with a significant increased risk of ovarian, breast, pancreatic, lung, and bladder cancer (AMT). Because of her strong family history of ovarian cancer a preventive ovarian removal was advised by the oncologist and the patient elected to pursue that option. After her surgery we did a post-operative version of the Bio-Thermal Therapy ® to assist healing and reduce complications from surgery. She came through very well. Our patient completed her one year course of HDIVC along with her prescribed Bio-Thermal Therapy ® treatments and continued oral herbal medication. Her next AMAS test was in the normal range and continued to remain so as she was periodically tested approximately every 6 months following. She has now been in remission for 6 years. Here is a sequence of her peripheral smear blood photos over several years. A 27 year old woman presented to the clinic with 3 years of severe acid reflux and nausea. She had suffered ‘all of her life’ with the symptoms, but the previous 3 years were unbearable. She awakes nauseous and feels sick after all of her meals. The symptoms worsened after being hit from behind by a wave in the ocean that bent her backward suddenly. At its worst she was completely incapacitated and unable to work, she also was anemic and suffered through heavy monthly cycles. She was exhausted and tired ‘all day'. The impact on her marriage was challenging and while her husband was being very supportive, she longed to have more vitality for the relationship. Endoscopy has been performed twice and showed that the valve of the lower esophagus that closes the stomach to protect the esophagus from acid was not working correctly. She was taking Prilosec, Zofran, Iron supplements, and Medical Marijuana, nothing was working. It was discovered she had an intolerance to animal Milks and foods containing them, as well as Potatoes when eaten in combination with Grain. She would meet with our inhouse nutritionist to be educated on the naturopathic sciences of eating and food nutrition and also to answer questions related to her food intolerances. She was prescribed nutrients to restore both her iron and sodium sulphate mineral deficiency, discovered with her initial workup. She was also prescribed a Chinese herbal formula that would improve nutrient absorption and helps to heal the lining of the gut, as well as restoring normal muscular motility waves in the digestive bed. Nutrient concentrates were prescribed to improve liver and kidney function, along with glandular concentrates and Chinese herbs to support normal hormonal rhythms. As this natural treatment began, she was to continue her regular medications as well. We started with a series of 10 Bio-Thermal Therapy® treatments. 2 treatments each week were designed to improve both digestive and esophageal valve function, normal motility, and to heal the lining of the digestive tract. Special attention was paid to improving bile flow from the liver, in order to reduce regurgitation of bile acids into the stomach. Acupuncture points that complimented the electrotherapy were administered as well to reduce inflammation and improve digestive enzyme secretion. The spinal nerves of the kidney interdigitate with the spinal nerves of the stomach at the spine, and In some cases, a urinary tract infection will present with nausea for this reason. In this case, the trauma of hyperextension that immediately preceded the aggravation 3 years previous, was a clue to identifying a physical stress that contributed to the symptoms. That type of trauma can knock a kidney out of position and add to the nausea. In order to treat this trauma, Naturopathic Manual Therapy was given once a week to reduce the hiatal hernia, as well restore her prolapsed kidney to the appropriate position. 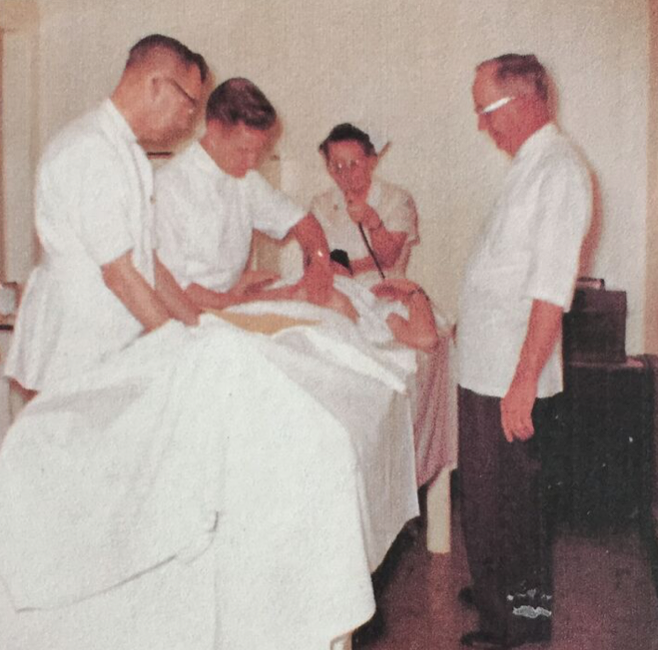 Picture of Dr. White (right) Dr. Jacob (middle) and Dr. Failor (left) performing an abdominal manual therapy at the Happy Acres Hospital in McMinnville, Oregon in the 1950s. Dr. Jacob trained Dr. Blake in the hiatal hernia and dropped kidney corrections. The Happy Acres Hospital in now a golf course and the original central building still remains. At her 6 week checkup after her first stage of treatment her nausea and reflux were mostly gone, with only some mild and occasional symptoms still presenting. She had stopped the Zofran and Medical Marijuana and was feeling more energized, even saying she ‘feels amazing for the first time in years’. At this point we reduced the Bio-Thermal Therapy® treatments to once weekly along with manual therapy to help with some continued low back pain and the likelihood that the hiatal hernia would need periodic correction. Her hiatal reflexes and kidney reflexes were not present so she was holding those corrections. We were very happy about the improvement but there was still more work to do. Although her symptoms had improved, there was still evidence of inflammation, caused by bacterial overgrowth, we were determined to resolve. We had relief of symptoms but correction of the digestive tract would take more time. She was still on Omeprazole which can be very challenging to withdraw from, especially when it has been taken for many years as in this case. At this time we began to slowly wean her off of the Omeprazole. With the inflammation reduced and the symptoms abated, we could harness the improved quality of the blood to heal the tissues. During this time the patient completed another round of weekly treatments. While the patient had significant “relief of life long standing symptoms” within a short 6 week period, at 6 months of treatment, after 46 Bio-Thermal Therapy® she was fully weaned off of her Omeprazole and asymptomatic. Her hair was growing in strongly, skin was glowing, digestion and energy doing great, with her anemia well resolved. She then moved on to maintenance treatments and had a new lease on life. She started a new job in another part of the state and moved away remaining stable for 7 months, she had some mild aggravations but those were handled with a series of ‘tune-up’ treatments. Here is a picture of a peripheral blood smear at one year. A 60 year young female patient presented to the clinic with stage 4 breast cancer that she had been diagnosed with about 8 months previous. The tumor was estrogen positive, progesterone positive, and had a high proliferation rate. The tumor enlarged after a biopsy and the conventional approach to her care had been very unpleasant. She had worked with another naturopathic physician before but had no clear path or treatment plan, and the tumor was only advancing. She had significant pain in the neck and shoulders as well as difficulty sleeping. She was found to be deficient in essential fatty acids and her kidney and liver were having a hard time keeping up with their responsibilities to cleanse the blood. She tested positive for a bacterial overgrowth that stimulates the tumor to grow. Cherry moles on the skin indicated a higher than normal level of estradiol, and her blood pressure was elevated. On her hands she had only two ‘moons’ (lunula) which indicate impaired circulation and oxygen distribution to the body. They were found to be an independent risk factor for cancer development. We advised her on our Anti-Cancer Diet, uniquely modified to fit her nutritional needs, as well as cancer type. She also tested as intolerant to milk and milk products, as well as fruits when combined with cane sugars. We prescribed whole food concentrates to improve liver and kidney function. We used a comprehensive anti-cancer herbal protocol specific for her type of cancer. This combination of clinically and laboratory tested natural medicines to improve immune attack against cancer cells, and to disrupt various phases of cancer cell growth, replication, and metastasis. We also started her on intramuscular mistletoe injections, a very effective treatment for cancer developed in Germany with over 70 years of research behind it. Along with these treatment plans, we also referred her to an oncologist for evaluation and treatment recommendations. We began comprehensive therapeutic clinical interventions, starting with a series of 3 weekly Bio-Thermal Therapy® treatments. These were designed to improve the body’s fight against the tumor by assisting digestion and improving immune, liver and kidney function. We initiated high dose intravenous vitamin C therapy that was well above what can be taken orally. There is extensive laboratory and clinical research showing the benefit of High Dose IV Vitamin C (HDIVC) in cancer. Our clinic follows the University of Kansas protocol that is designed to be used either in conjunction or independently of conventional oncological care. We did these on the same days as the Bio-Thermal Therapy ® treatments. We had a follow up at one month. In that time she had established integrative care with an oncologist who completed a PET scan and had started her on an estrogen blocker (Letrozole). After the PET scan confirmed the bone metastasis she initiated Zometa infusions with the oncologist to reduce its growth. Here is a picture of her peripheral smear at one month checkup. At her 1 month checkup she was already feeling much better mentally and emotionally while her cancer tumor markers were being monitored. Now that the quality of the blood was improved, due to improved internal organ function and lower inflammation in her system, we could harness that renewed power of the body to fight the cancer more effectively. At this time we continued the internal natural medications as well as the mistletoe injections.We reduced the frequency of Bio-Thermal Therapy ® treatments to twice weekly. At one treatment we would do the HDIVC and at the other we would administer intravenous Curcumin, which also has anti-cancer tissue effects. Under this care she continued to improve over time. Her tumor markers lowered in a serial fashion over the next 6 months to normal levels present in healthy persons, as did her Alkaline Phosphatase’s which were elevated before as a sign of bone metastasis. Her tumor softened and shrank and by 6 months of care her conventional oncologist reported that she was ‘near complete remission’. Here peripheral smear of her blood at that time. We continued supportive care, reducing the frequency of treatments over the following year. Here is a peripheral smear of her blood after one year of care. Through the course of her healing process, the peripheral smear pictures of her blood inspired her creatively. She began drawing and cartooning her healing process ad this deeply therapeutic practice culminated in a book called Celltoons: The Story of Cancer at a Cellular Level. Click here for a link to the book as well as her story in her own words. We are deeply humbled and it gives us great joy to have worked with her on her journey. A 73 year old woman came to the clinic from Columbia, South America. We had successfully treated her sister's cancer and she was suffering from a neuropathy that could not be clearly diagnosed. The neuropathy felt like a stabbing sensation and had started on both toes. It gradually progressed upward to the legs and then to the waist and eventually up to the mid chest. She occasionally had to drag her legs to walk. Whereas initially it had been sporadic symptoms coming and going, it was now constant and only lying down provided some relief. The symptoms had started 6 years previously. During that time, she had seen 8 different specialists ranging from rheumatologists to neurologists, and many in between. She had tried different medications, chiropractic, etc. with no benefit. After a shingles episode in which she was hospitalized for a week, the symptoms only progressed to the point where she could not stand up without holding on to things. She was losing her eyesight, had painful watery eyes, and her bowels movements were poor with small amounts of stool passing in little pieces. The patient's gait was very slow and unsteady and she showed signs of significant inflammation in the blood, along with leaky gut and overgrowth of unhealthy bacteria (SIBO). She tested positive for infections that can lead to neurological autoimmune reactions. We reviewed the workup done by the other specialists and discovered when all of the labs were compared, that she had an unusual presentation of Sjogrens disease neuropathy that developed after her reaction to the shingles episode and activated the latent autoimmune tendency. The results showed she had an intolerance to milk (dairy), as well as potatoes when eaten in combination with grain. She would meet with the nutritionist and also start the dietetic portion of a Nutritional Purification program, in order to review the naturopathic autoimmune diet that we prescribed. Medicinal food concentrates were administered to reduce pain and joint inflammation and to detoxify the liver. Custom medications specific to her case, along with herbal extracts, were delivered to help stimulate her body to clear sub clinical infections associated with the autoimmune reaction. Nutritional supplementation was given to provide fiber and nutrients in order to support organs of elimination, which regulated her bowel movement, and provided immune support. For her case specifically, 2 forms of treatment were prescribed. Daily Bio-Thermal Therapy® Treatments (4 weekly) over 4 weeks were prescribed to improve detoxification, immune regulation, neurological function, and circulation to the periphery. Acupuncture was also used, in order to target problems in the liver, colon, and legs. At her 1-month checkup the neuropathy she was significantly better with less painful flares overall. The neurological symptoms that ranged from the chest down to the toes, had begun to recede as she progressed through the month of 12 treatments. It continued receding downward to the abdomen, then to the hips, then at one month only was from the toes to the knees. Her energy level was much better, as well as her sleep. She was still having some mild bladder incontinence, but the urine stream which had previously been weak was now much stronger. We continued with the treatment plan as she was getting better. She received treatments for one more month and then had to return to Columbia, after having 27 treatments in total. By the time she left, the leg pains were mostly resolved, the neuropathy was only on the feet to the ankles, and the bladder incontinence had resolved. We prescribed a home course of treatment for her in Columbia and it was reported that the neuropathy fully resolved soon after her return. She was still doing well 4 years later. A 36 year old woman presented with a diagnosis of fibromyalgia. She was diagnosed six months prior, but had been experiencing debilitating symptoms for the last year and a half. Symptoms started after a 36 hour influenza infection. Upon presentation, she is experiencing crushing fatigue and pain. Unable to work, her entire body aches. She has a history of ovarian cysts and hormonal acne. She experiences insomnia and is awoken from sleep due to pain. Headaches lasting 3-4 days occur each week and include nausea and vomiting. She has gained 30 lbs. in the last two years. After performing our 12-point diagnostic evaluation, we found signs of significant chronic adrenal gland stress, thyroid dysfunction, gallbladder congestion, overgrowth of intestinal bacteria, chronic throat infection, significant inflammation, and a pattern of Chronic Hyperventilation Syndrome. Medicinal food concentrates were administered to improve adrenal gland function, kidney and liver function, and to restore mineral deficiencies identified through blood testing. Herbal extracts were given to improve thyroid function, help reduce pain and improve circulation to the tissues and joints of the body, to detoxify the colon and bowel to address unhealthy gut bacteria and to improve hormonal regulation. Nutritional supplementation to provide fiber and nutrients in order to support elimination and regular bowel movements, and for immune support to fight a chronic infection of the throat. 12 Bio-Thermal Therapy® Treatments over 6 weeks were prescribed to repair organ function, digestion, drain lymphatics to heal the skin, lessen nausea, and reduce inflammation. 6 Intravenous Nutrient Therapies were administered to rapidly saturate the body with bioavailable nutrients available at a cellular level to support immune function and replete the body for a more rapid recovery. Intramuscular injections of B vitamins were administered weekly. CES Device- Can be used during treatments or rented out of the clinic for home use. Cranio-electrical stimulation (CES) to promote relaxation in an effort to help sleep and manage anxiety. Several research studies show a significant reduction in pain and improvement in sleep cycles in patients with fibromyalgia. The headaches went away, and within a few weeks, she started noticing that her energy and mood was improving as well as her digestion and bowel movements. Within a month she was sleeping better – up to 6.5 hours at a stretch and was having significantly less pain. By 4 weeks she said she was ‘feeling great’ and went for a bike ride, her first bike ride in 6 or 7 months. At treatment during her 6th week she reports that she went kayaking for 2 hours followed by a 20-minute bike ride the following day. This did not provoke pain or fatigue. At her 2 month check-up she reported that she has had none of the 3 or 4 day headaches at all. She has a had a couple of mild headaches that lasted 30 minute and were associated with dehydration – easily resolved by drinking water. Her energy is much better, she is active, and her mental fog has cleared. She has lost about 10 pounds, she is sleeping much better and feels rested in the morning. She was healing and to continue the support of the process she continued her treatments but at a reduced frequency. She was prescribed a Bio-Thermal Therapy ® once weekly. Every other week she would receive the Respiratory Rehabilitation Therapy and every other week (alternating weeks) the Intravenous Nutrient Therapy. A month after her first checkup, 3 months after starting care, she reports that she hiked 40 miles at elevation in the Denver, Colorado area. She continued to improve with decreased pain and increased energy, started doing yoga, walking daily and learned to see the patterns between food, weight, and skin. The patient moved from the area and was followed up via phone, around 10 months after starting care. She reported that she had lost 17 pounds and was regularly swimming a variety of front, back, and breast stroke, walking 11,000 steps daily, her energy continued to improve….and was planning a backpacking trip for the Grand Canyon in the fall. 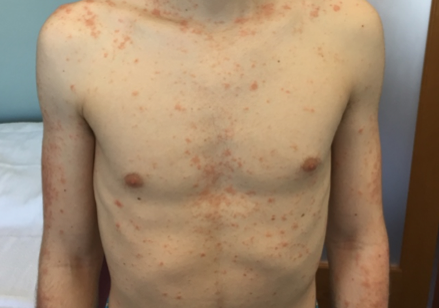 A 20 year old man presented to the clinic with 5 years of stomach pain that awakes him from his sleep, and then makes him vomit for several hours every morning. 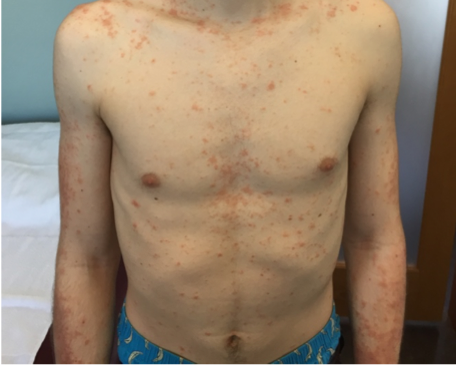 In the 6 weeks before coming to the clinic, he had a global outbreak on the skin. Not able to sleep, exhausted all the time, and feeling unable to socialize. After being given topical steroids, dermatological symptoms only worsened. After performing our 12-point diagnostic evaluation, we found signs of adrenal gland stress, kidney dysfunction, liver congestion, overgrowth of intestinal bacteria, anemia, and inflammation. An intolerance to dairy, as well as potatoes when eaten in combination with grain was discovered. He would meet with the nutritionist and also start the dietetic portion of a Nutritional Purification program. Medicinal food concentrates administered to promote relaxation and to support optimal liver and kidney function were given. Herbal extracts given to help promote proper elimination of metabolic wastes, regulate the immune system and manage stress response, enhance gallbladder function, and to soothe the digestive system. Nutritional supplementation to provide fiber and nutrients in order to support elimination and regular bowel movements, and for immune support. After 6 weeks (12 treatments), patient reported that the nausea and vomiting were entirely resolved. The stomach feeling “perfect,” skin breakouts were resolved, and able to play tennis and socialize again. Feels amazing for the first time in years. CES Device - Available at the clinic during Treatment and to rent for home use. Cranio-Electrical stimulation (CES) to promote relaxation in an effort to help sleep and manage anxiety. Here is a picture of a peripheral smear of his blood at this point. Here is the blood after 6 months.